Calling all things flamingo and Caribbean! 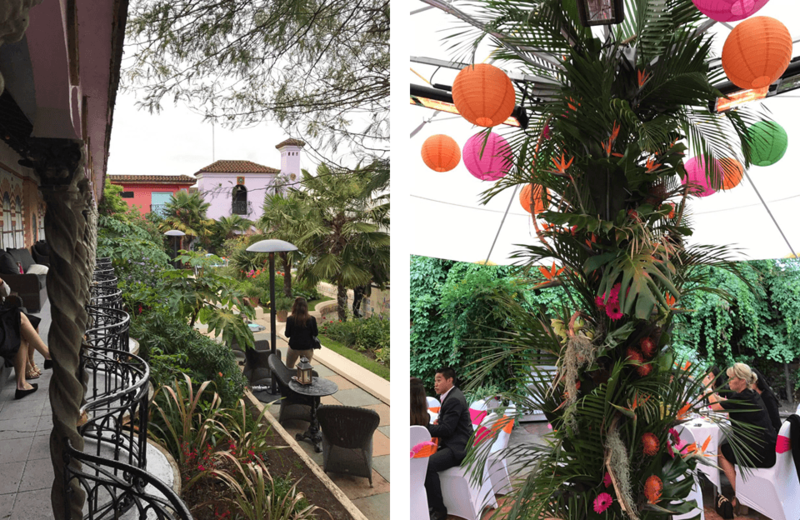 Last night we headed over to Kensington for a Caribbean-themed showcase at the Kensington Roof Gardens. 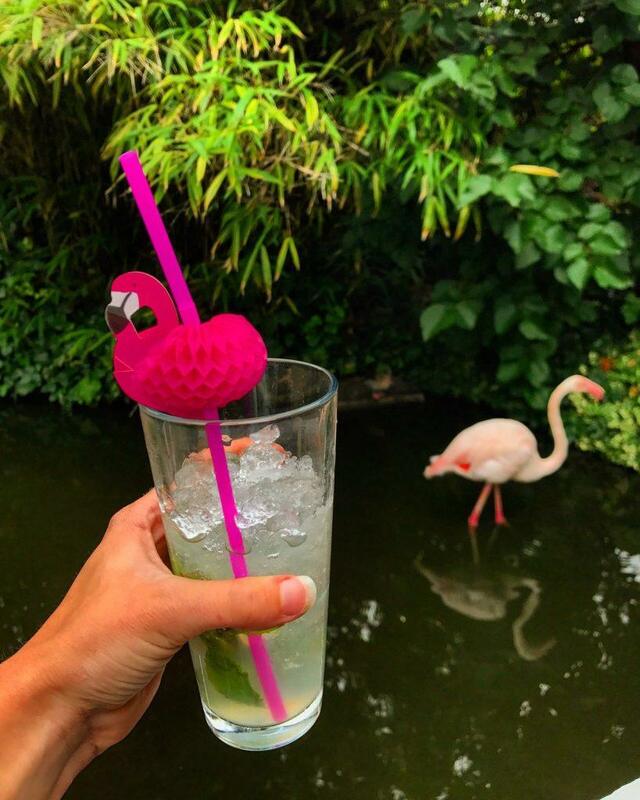 You know we’ve got a soft spot for this place (hello, there are real-live flamingos!) but more importantly we’ve also run some fantastic events here in the past. It’s an amazing space both inside and out, so we were excited to see the Caribbean theming transform the venue. Easing us in gently: the lift to the top floor was filled with flowers and palm trees, to the point it lessened the maximum capacity! After a few selfies, we couldn’t wait to get to the roof garden. 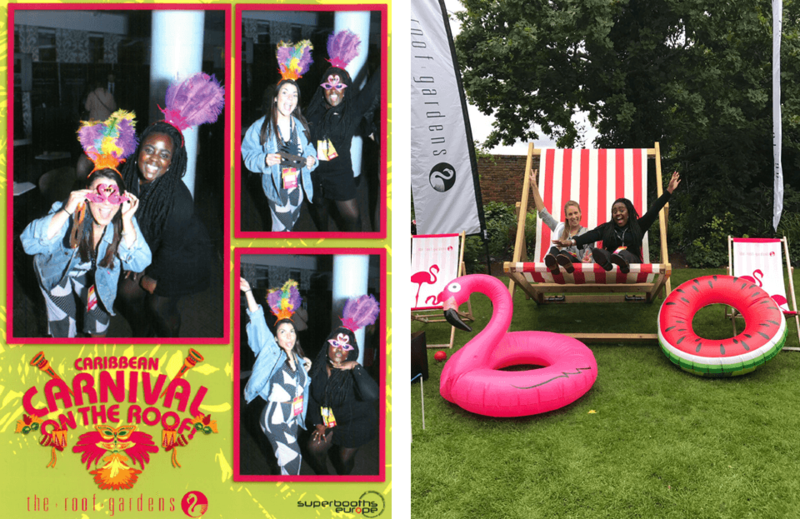 The space was split into several food stations, with a live music from a steel band, some limbo, as well as decorated seating areas and an abundance of inflatables and giant deck chairs. The Caribbean theme continued with the catering. They served burgers, sweet potato fries, jerk chicken, rice and peas. There was also a rum-infused cocktail menu (accompanied with flamingo straws, of course), and sweet stations which displayed a rather impressive three-tiered cake made by GC Coutour, tropical-flavoured cupcakes and macarons. There was even an ice cream station where we helped ourselves to fresh strawberries. At every station there was the opportunity to collect a stamp, and if you got all the stamps you would be entered into a competition to win a Virgin holiday to the Caribbean! This is a great way to get visitors to explore every area of the venue (and also helps hugely if you’ve got a swanky holiday to give away as a prize!). Despite the weather not really being on our side, the venue team provided guests with blankets to keep warm. We wondered if the flamingos would get little coats (we read up on this: don’t worry, they’re ok in the UK all year round). All-in-all it was a great showcase, and one we were very pleased to be invited to. Thank you to the Kensington Roof Garden’s Team! Do you love Kensington Roof Gardens as much as we do? Tell us all about it on Twitter!